To metaphorize the world as a theatre has been a common procedure since antiquity, but the use of this trope became particularly prominent and pregnant in early modern times, especially in England. Old and new applications of the "e;theatrum mundi"e; topos pervaded discourses, often allegorizing the deceitfulness and impermanence of this world as well as the futility of earthly strife… . It was frequently woven into arguments against worldly amusements such as the stage: Commercial theatre was declared an undesirable competitor of God's well-ordered world drama. Early modern dramatists often reacted to this development by appropriating the metaphor, and in an ingenious twist, some playwrights even appropriated its anti-theatrical impetus: Early modern theatre seemed to discover a denial of its own theatricality at its very core. Drama was found to succeed best when it staged itself as a great unmasking. 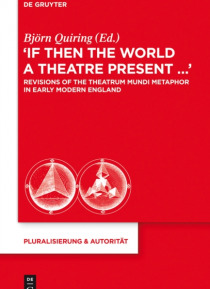 To investigate the reasons and effects of these developments, the anthology examines the metaphorical uses of theatre in plays, pamphlets, epics, treatises, legal proclamations and other sources.